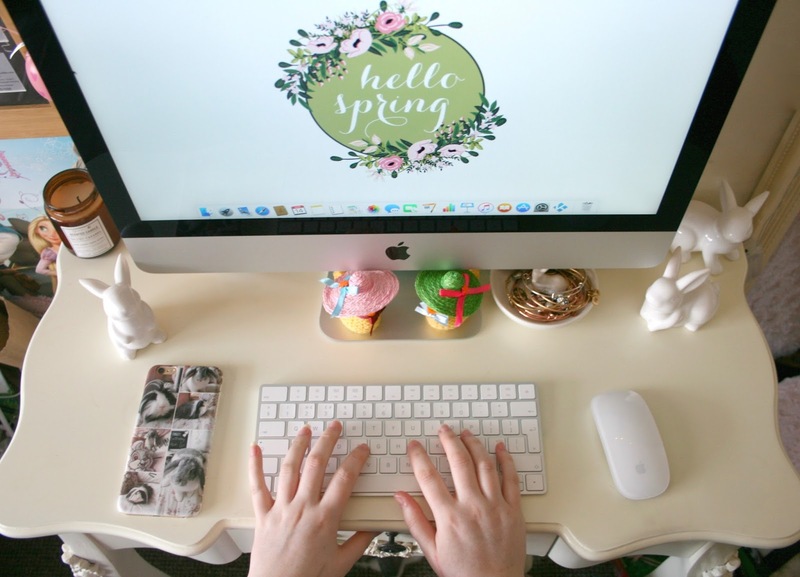 One day this week I just decided I wanted to add a little Easter to my blogging area and so I got any easter decor that I had out and laid it on my bed. I also brought the printer up to my room as I knew I was going to print out a few things too. My walls are super plain right now as I'm saving up to decorate so I kind of just stick anything and everything on them at the moment. I decided to print out four photos all together, technically I did print six but some errors occurred and so I acted as if they never happened. I printed out my favourite photo of Sheldon and of Aurora and simply hung them, as they weren't very Easter themed, I found the two Bunny pictures on Pinterest and thought they were just too adorable not to print out and have on my wall. 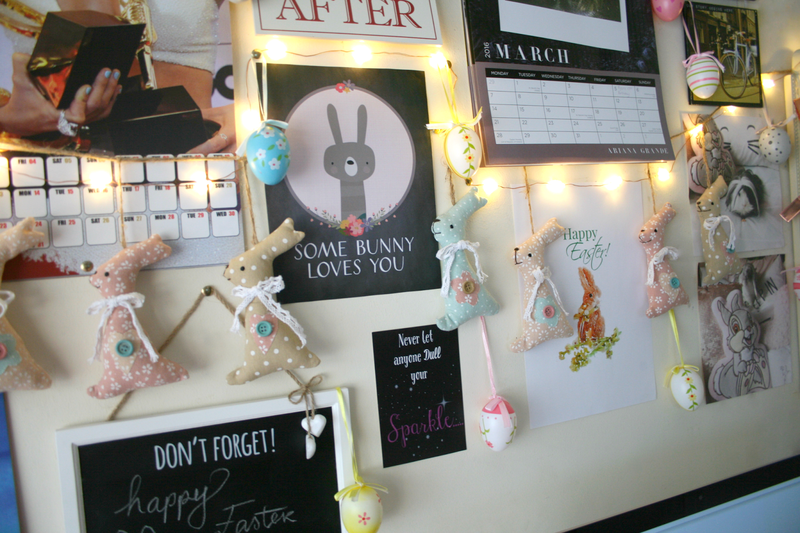 I also covered my wall in different painted decor eggs and added a Bunny bunting which I bought last year and actually keep hanging up all year round as it's so adorable. I just move it around for the occasion and then back to it's original place. I finally added some copper stringed star lights around the bunting so I can have them on while I'm blogging and they just create the most warm cosy light ever! 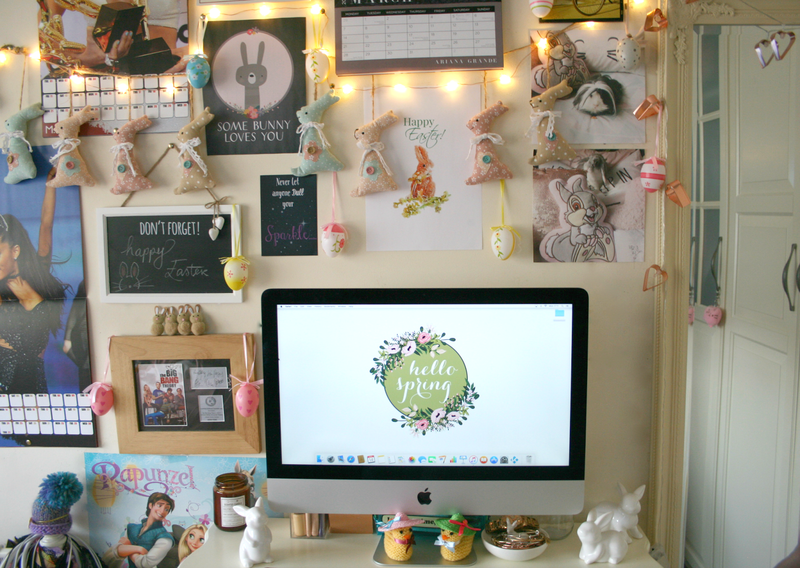 I kept it to a minimal on my desk as it's not that big and I need room to add that clutter that's never included in these photos ;) I currently have three ceramic white bunnies and two chicks with little bonnets on. Along with those although not very Easter themed I also have my deer jewellery dish holder and my salted caramel candle aswell. Do you decorate your space for Easter? You room looks so gorgeous I'm jealous!